At the London Summit on Family Planning, Uganda committed to reduce unmet need for family planning from 40% to 10% by 2022. Uganda will increase the annual government allocation for family planning supplies from US$3.3 million to $5 million for the next five years and improve accountability for procurement and distribution. The government will develop and implement a campaign for integration of family planning into other services. This will include partnerships with the private sector and scaling up of innovative approaches, such as community-based distribution, social marketing, social franchising, and youth-friendly service provision. Uganda will strengthen the institutional capacity of public and community-based service delivery points to increase choice and quality of care at all levels. 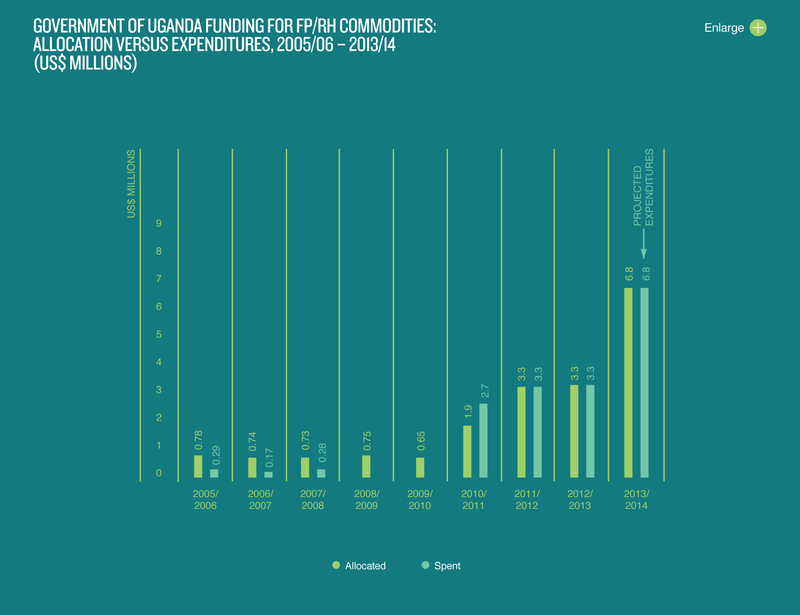 In September 2012, the Ugandan Ministry of Health brought stakeholders together to begin an intensive, collaborative effort to capitalize on President Yoweri Museveni’s commitment to FP2020. Partners in Population and Development Africa Regional Office (PPDARO) convened members of parliament to share the President’s commitment and devise an action plan to hold the government accountable. The Uganda Family Planning Consortium (UFPC), comprising of all major private providers of contraceptive services and supplies in the country, strategized a total market approach to coordinate service delivery and increase access to a full range of contraceptive methods. Donors, government, and others assessed the realities of speeding delivery of services and supplies to ensure universal access to quality, voluntary family planning services. Within a year, the three main pillars of the commitment—increased national government investment in family planning, more donor support, and systems strengthening—had been accomplished. Specifically, the allocation for family planning supplies increased from US$3.3 million to $5 million in the current budget. UNFPA, USAID, and DFID exceeded the additional $5 million called for from donors. Finally, a reproductive health subaccount was established to track reproductive health resource flows and improve the National Medical Stores’ capability to distribute reproductive health supplies and commodities. The government and its partners are now working to create a unified and costed national plan for family planning using the FP2020 commitment as a guide and to firmly ground the plan in Uganda’s development priorities. The plan is expected to be completed and implementation underway by the end of 2013. The UFPC and Advance Family Planning have already begun expanding access to family planning through innovations supported by government policy. These innovations include task sharing for contraceptive procedures and provision of contraceptive injectables by village health teams, and postpartum availability of IUDs through voucher programs. PPDARO will lead efforts to track the continued fulfillment of the commitment. The first-ever Ugandan family planning conference will take place in December 2013, coordinated by the Ministry of Health, UFPC, and others, with support from UNFPA. Though Uganda’s family planning needs are acute, there is renewed optimism that progress is possible and that health and development prospects will be significantly improved. With gains made toward fulfillment of the FP2020 commitment, universal access to family planning is within reach. 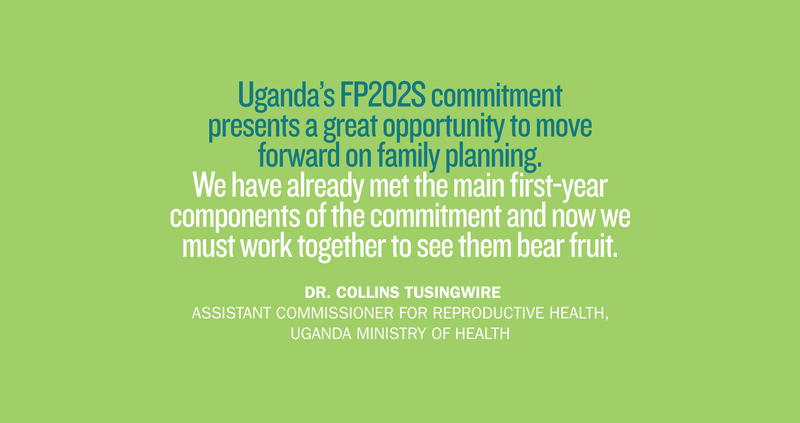 Uganda’s FP2020 commitment presents a great opportunity to move forward on family planning. We have already met the main first-year components of the commitment and now we must work together to see them bear fruit. Source: Advance Family Planning, September 2013.